comet | Pleasant's Personal Blog! Asteroid deflection strategies have been a topic of interest for those enamoured with space studies for ages galore. From NASA scientists to ordinary people they’ve garnered everyone’s attention. Simply defined, asteroid deflection strategies are the “planetary defense” methods[ref]http://en.wikipedia.org/wiki/Asteroid-impact_avoidance[/ref] using which these near-earth objects (NEOs) are diverted thereby preventing catastrophic occurrences on earth, ranging from tsunamis to impact winters (by placing large quantities of dust into the stratosphere, blocking sunlight)[ref]http://en.wikipedia.org/wiki/Asteroid-impact_avoidance[/ref]. While the probability of such an event occurring any time soon is deemed scant, certain recent events such as Shoemaker-Levy 9 have created enough headlines to get people wondering. About 90% of NEOs greater than 1 kilometer in diameter have been surveyed by NASA. On a scale of 1 to 10, a 1 kilometer diameter asteroid is deemed to be the least destructive while a 10 kilometer diameter asteroid is considered catastrophic enough to extinguish all life on earth. These survey programs funded by the NASA have been christened “Spaceguard”. 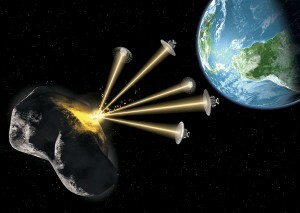 Their aim is to attempt to detect and document all asteroids including and exceeding 140 meters in diameter by 2028. This is often considered the easiest and quickest method. This can be done in one of two ways. A nuclear explosion can be instituted around, on or beneath the surface of an asteroid with the resulting blast evaporating part of the object and throwing it off course. This is a form of nuclear pulse propulsion[ref]http://en.wikipedia.org/wiki/Asteroid-impact_avoidance[/ref]. However, one can never be certain whether the NEO has been broken into small enough pieces to completely avoid harm. Fracturing a 10 kilometer asteroid into a six kilometer and four kilometer asteroid is great, but they might still be on target for our lovely little planet and carry worldwide devastation in tow[ref]http://io9.com/5861790/how-to-deflect-an-asteroid-attack[/ref]. An alternative method is to have a series of small bombs explode alongside the asteroid but at a distance enough to not fracture the object. 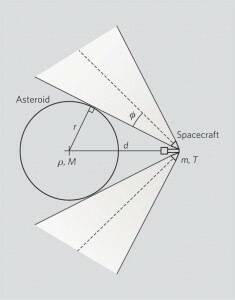 The relatively small forces from any number of nuclear blasts could be enough to alter the object’s trajectory enough to avoid an impact[ref]http://en.wikipedia.org/wiki/Asteroid-impact_avoidance[/ref]. A key factor however is to do so well in advance so as to have the maximum impact. This works through the impact of a gigantic, non-explosive object, such as a spacecraft or another NEO, a collision with which to alter the course of the asteroid. This strategy is being pioneered by the European Space Agency using a carrier craft and an impactor that can be released on command. Proposed by Edward T. Lu and Stanely G. Love, this method involves altering the natural course of an asteroid slowly over a period of time sometimes spanning years. The idea is to have a gigantic heavy unmanned spacecraft hover over an asteroid and divert it from its orbit through the simple mechanics of gravitational attraction. 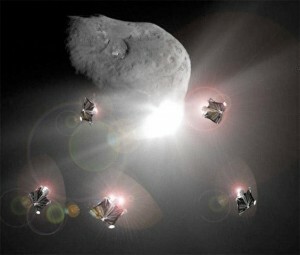 The spacecraft would attract the asteroid towards itself and thus deflect it from its original path. 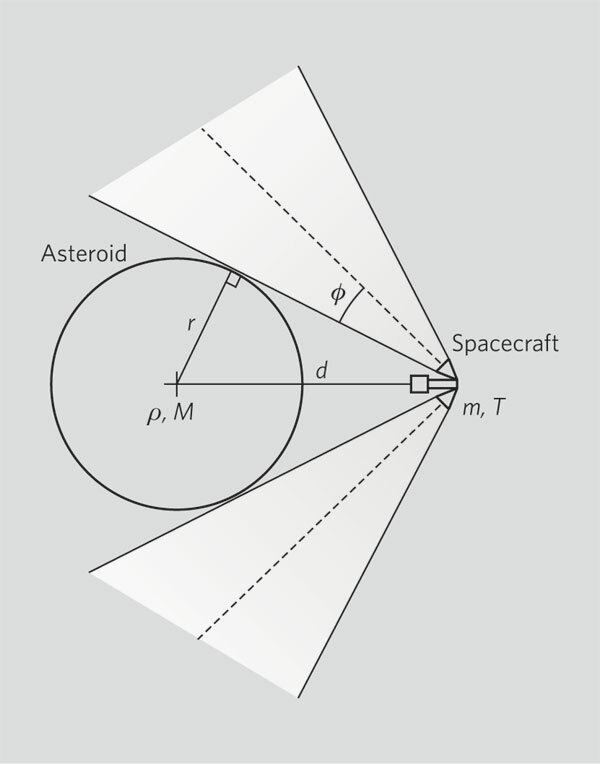 While slow, this method has the advantage of working irrespective of the asteroid composition or spin rate – rubble pile asteroids would be difficult or impossible to deflect by means of nuclear detonations while a pushing device would be hard or inefficient to mount on a fast rotating asteroid[ref]http://en.wikipedia.org/wiki/Asteroid-impact_avoidance[/ref]. 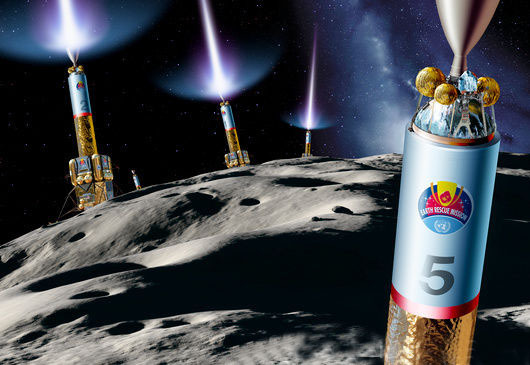 Based upon a proposal of theoreticians at Johns Hopkins University, attaching a rocket to an asteroid would propel it off of its path enough to avoid an impact with earth. Another method is termed the Madmen approach, in which a series of disassembles are docked on to the asteroid which then use the asteroid to create small pebbles which are ejected away from the asteroid. The presumed advantage is that it would take only weeks or months to reduce asteroid mass and velocity using this method and it would act as a safe alternative to chemical and nuclear explosives. It would be safe to say that it would be in humanity’s interest for several countries to have contingency plans and alternative methods ready in the unlikely event of an asteroid attack occurring anytime soon. Russia has some nascent plans in store while the European Space Agency plans to test its kinetic energy method on a non-threatening asteroid in 2015. In addition, NASA’s constant documenting of NEOs along with the search for effective deflection strategies should let us sleep easy at night.